Because they take up a great deal of eye-level wall space, cabinets can make or break the design of your home. However, it's also important for cabinets to be functional and useful . Whether it be for your family room, kitchen, bathroom, or bedroom, we at Knotty Alder strive to match you with cabinets that will accentuate your style while providing the storage space you need. Your kitchen is the area in the home that requires maximum efficiency and aesthetic unity. When choosing cabinets for your kitchen, the first thing to consider is the layout. Determined by the placement of the countertops, the layout dictates the overall flow of the kitchen and the paths you take from each appliance when preparing a meal. It's true that some layouts are more efficient than others, so choosing the right cabinets can greatly improve the efficiency of your kitchen. If you have a single wall or galley kitchen with limited counter space, you may want to conceal your microwave in a bass wall cabinet. For more versatile layouts like G and U-shaped kitchens, you may want to install more spread out cabinets that utilize the wall space and avoid giving your kitchen a cluttered look. Though we have adopted a “ready to assemble” (RTA) and “do it yourself” (DIY) business model, we take all of these factors carefully into consideration. If you have any questions about if you have any other questions about kitchen layouts, and how our cabinets can optimize them, call us at 1-888-923-7833 or fill out our online question form here. Cabinets can be an easy, efficient, and creative way to enhance your family and living room areas. The most popular application of cabinetry in the family room is as part of an entertainment center. We don't, however, recommend having too many cabinets in order to keep the room from feeling cramped . A proper balance between shelves, display cases, and dynamic cabinets will optimize both the storage and wall space of your entertainment center while striking a proper balance between style and comfort that every family room needs. If you have an open concept floor plan, your kitchen and family room are likely part of one bigger living space, and you may want to install cabinets that match your kitchen to unify your open concept. 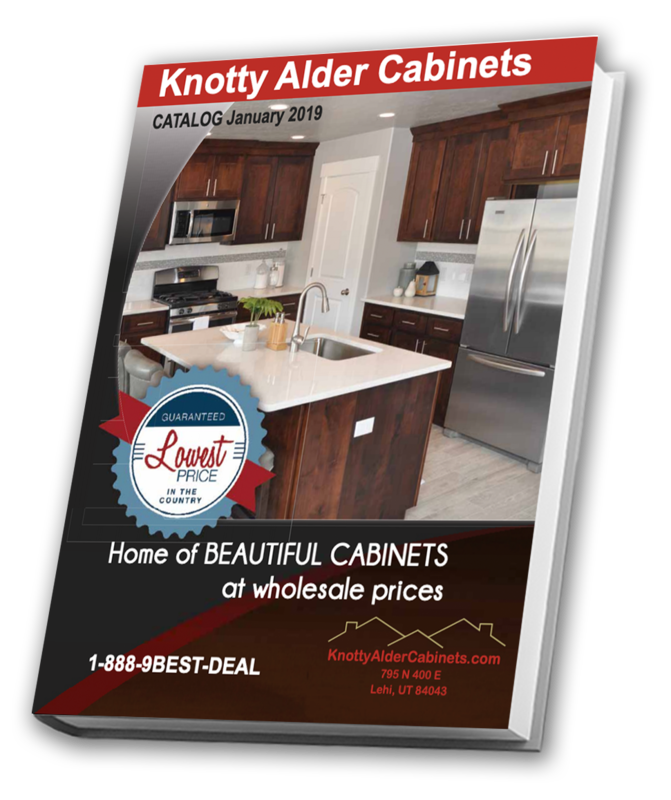 Whatever your floor plan and budget, we at Knotty Alder want to make sure your cabinets are right for you and your daily living needs. Feel free to contact us with any other questions about family and living room cabinetry. Bathroom cabinets can provide much needed storage in what is usually a small, narrow space. We have a variety of styles and finishes that complement both rustic and modern bathrooms. Regardless of the amount of space you have in your bathroom, you may want to keep your cabinets below the vanity to give your bathroom a clean, uniform look. One of our specialties here at Knotty Alder is our attractive yet affordable wholesale bathroom vanity cabinets. Should you decide your wall space is ample enough to have hanging cabinets, we are ready to help you achieve adequate bathroom storage without making your bathroom feel cramped or cluttered. With our RTA bathroom cabinets, you’ll be able to build the bathroom you’ve always wanted at an affordable price. Contact us for more information on how to install your cabinets without exceeding your budget.